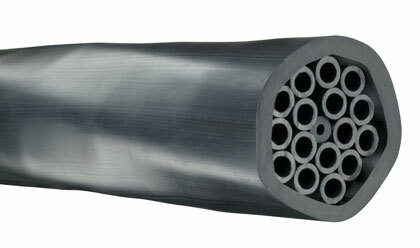 Tubing bundles utilize 1/4" and 3/8" OD size HDPE tubing as separate bundle configurations, or in combination. Inner tubes are number-coded to make for easier application installations. Cabled construction provides a tighter bend radius and increased flexibility. Ideal for use with in-plant pneumatic instrument equipment and for oil field BOP pneumatic equipment environments. Click here for more info.